Soutien Gorge's first release on Boltfish is a beautiful 5 track addition to our popular 3 inch series. "The duo created by András Hargitai and Róbert Potys is getting forward without any failures, fighting our age’s hardships and obstacles. This time the UK label Boltfish has released their EP (literally, it is a little record, because it is burnt to a 3" cdr), entitled Vízállásjelentés. The title could be interpreted as a keyword, since all the five tracks can be linked to this theme. Listening to Madárka not only the birds that live next to water come into being in front of our eyes, but little spiders and insects that run on the surface of water too. The track Tierchen Liebe (that is something like "The Love of Tiny Animals") not only brings human feelings (romanticism) into the tiny creatures’ souls, but we ourselves feel as well as if we were tiny creatures on this planet. The mid-track of the record (Strandra) is none other than a landscape of sandy beach, with foamy sea-waves, semi-open bars, mixer boys and waitresses… The next track is to be short: "Az Országos Vízjelzõ Szolgálat jelenti": "Vízállásjelentés". Last, the 20 minute long ambient-chill-electronica material closes down with Jó éj. Thanks SG, we love it!" "Boltfish deliver another little gem in their 3" CDr series and this time it comes from Soutien Gorge - the duo of Andras Hargitai and Robert Potys. It kicks off in a style that can only be described as contemporary melodic minimalism and it almost sounds like it could be a 12k release... but then we get those rhythms cutting into the mix and it combines into a lush, trademark Boltfish style that's accessible, easygoing and full of flavour. Interestingly a couple of the tracks feature guitars which is unusual for the label and whilst the first time you hear it it's a suprisingly robust rocky sort of sound, when it appears again later on it's a more delicate and acoustic sound. Altogether it makes for an engaging listen. Very nice indeed... as you'd expect really from this great label." "Soutien Gorge have been creating records for years. 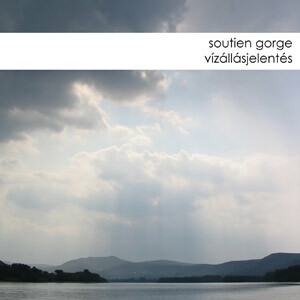 Vízállásjelentés has been released at a small UK label on tiny (3-inch) cd, limited to 50 copies. What can be heard on it is moderate, emotional IDM-related electronic music, sometimes with a little bit of 8-bit sound (okay, it is a bit more than that, let's say 11-bit), with many processed ambient-like sounds, and with some guitars. Sometimes it features intentionally simple and a bit amateurish (bedroom-electronic musician-like) drums. This time (luckily) there are not many Hungarian speech samples, except for the title track, which possibly awakens nostalgic memories in every Hungarian person, because yes, processed lyrics of 'vízállásjelentés' can be heard in it (The name means a radio programme with announcements that included the heights and temperatures of our two rivers and lakes at certain cities. It went on for decades on our state-financed radio stations. That is the speech you can actually hear in this track – the translator). This track is uploaded to their myspace. But I have no idea what it awakens in a non-Hungarian person. The record is pleasant in general, but it features exactly that kind of pleasantness which does not leave a trace after itself, no matter how many times you have listened to it. (C+) "
"Here is the promotional material of Soutien Gorge’s latest release on my desktop – it can be preordered at Boltfish since the day before yesterday. I was wondering for a while whether it is fitting for me to write about it or not, but then I decided that it is a kind of civil service to do it. The album begins with the track titled Madárka, and within that track it begins with bird chirping. Because Banyek is like that. A few weeks ago he dared to entertain Radio Tilos’ night time listeners with bird sounds from the Soviet Union, and some Gregorian chants as well. The song rapidly transforms into the slow, smiling, head nodding, and happy electro that became somewhat SG’s trademark. Real birds’ place is taken by chipbirds. Modem noise startles me from the dreamy state, Tierchen Liebe starts. But the track itself is rather calm, and it makes the listener think. The trademark I mentioned above is present in a softer manner, furthermore there are so long guitar themes that I don’t even remember when was the last time I heard something like that in a SG song. The album’s hidden favourite is that song, even if it finally melts into the noise and buzz that emerges time and time again in it. The title track Vízállásjelentés is not a hidden favourite, though. It immediately reminded me of the earlier terribly long titled SG song 'Story Told In The Town Of Friendly Tentacle Worms' which also – I don’t mean it pejoratively – has a childish atmosphere. Radio announcers’ voice who read the ‘Országos Vízjelzõ Szolgálat’s (the institute that measures the waterheights of the river Danube here in Hungary – the translator) information that appear as magical incantations in the track, some echoes and bleeps are what turn the song into a musical nostalgia-generator. Everybody has probably heard a ‘vízállásjelentés’ in his or her life anyway (The name vízállásjelentés means a radio programme with announcements that included the heights and temperatures of our two rivers and lakes at certain cities. It went on for decades on our state-financed radio stations. That is the speech you can actually hear in this track – the translator), and the radio – although it tries to do its best – is turning into a nostalgic experience. The minialbum is closed by Jó éj. Slowly, soothingly, making the listener fall asleep. I have left one song for the kind readers, even if they don’t want to or cannot – the release is going to be limited on 50 copies – buy Vízállásjelentés. You can listen to the track Strandra at Soutien Gorge’s myspace page (http://www.myspace.com/soutiengorge), which is more rousing and moving than the album’s other songs." "We pushed Soutien Gorge’s latest 3" cdr under the electronic microscope, and analysed it with the help of different kinds of solvents. Look out, it hasn’t even been released yet! It was 2 years ago when I could start a discourse about a Soutien Gorge (hereinafter SG) record. At that time it was a little bit harder to take it in, but having heard Vízállásjelentés, which is to be out very soon, I was blown away immediately after the second listening. I don’t know how many concepts have been squeezed onto the disk, but this latest record in my opinion is a less personal set of messages. It is not a love letter, and even not an impression of a dissapointment concerning love. It is rather a sequence of soundscapes that contacts everyone, and puts the Self in the background -or rather pensions it off-. SG is not explaining anything now, but it tells us a tale. It rather projects something than telling us a tale. The time passed after the release of the previous record (L’étoiles Souriantes) was good for these two guys. It marinated and salted them, and made them prepared. At the time when I first came round after the listening, I was just explaining to Banyek that this material is how much more serious and elaborate, and how much they are moving to the ‘frontline’ of our native (or international) scene. Since experience and developing professionalism stand in the background of this record. My favourite "Rumcajs-double" mate then wrote back simply that surely, there are so many of them (he meant professional amateur/amateur professional producers). And of course, he is right with that: There are plenty of people who experiment with similar sounds, similar successes and failures. But even if it is so: Banyek and his "science" is ours, and he rewards our love, since he is becoming more and more professional, he forces us with his soft pieces of music to a dreamland, and his products can be consumed by everybody. You don’t have to yell that "But please, it’s electronica!". Yes it is indeed electronica, but it is suggested for every age group. If you would like to slow down instead of driving at the speed of evil big cities or like to slobber and contemplate or just simply like to let the minutes pass by, then this record is the perfect Hungarian soundtrack for that. It is a walk in the forest or near some water, between stars or under the duvet. And now let’s see the tracks! 01. Madárka: Soft chirping and slow beginning. A mixture of mid-tempo clicking and bleeping sounds that stroke our hearing organs. A walk in foggy forests in the autumn, the sweet smell of fallen leaves that were dropped up. Jim Jarmusch’s Dead Man crossed my mind when I heard the guitar that strips the track at half of its way. That is really a tune like that. Neil Young would salute. 02. Tierchen Liebe: A slow piece with a distorted whistle-concert and guitar. A test to re-enact our feelings that we felt when our dog/cat/grasshopper fell upon our necks for the first time. I would prefer chameleons rather, but this track tells something to every person who owns a pet. Okay, dogs can skip the higher tones, avoiding any yowl or anger. 03. Strandra: An ode to joy which starts with slow and cold sounds. The sunshine and the praising of life next to splashing volleyballs, and dipping arm rings. At the end of the track we can peep into a 70s disco with some mushrooms. It makes me smile and fills me up, for sure. 04. Vízállásjelentés: The date of the announcement is not too old, but the memories that awakened in me are indeed old. The institute of ‘vízállásjelentés’ (The name means a radio programme with announcements that included the heights and temperatures of our two rivers and lakes at certain cities. It went on for decades on our state-financed radio stations. That is the speech you can actually hear in this track – the translator) is something that everybody should remember. Last year there was no typical shrinkage of rivers, so ‘trackers were allowed to meet each other’ (a phrase of the radio programme that became somewhat an adage here in Hungary – the translator), but the feeling was brought back anyway when I was listening to it. Calm summer days on the half-open corridor of the apartment, the smell of lunches that are being prepared, the fly of soap bubbles from underneath the lilacs. 05. Jó éj: The purgation of a noisy head that is sunk in thoughts, within PI minutes. The sobering effect of the road to home from the bar or the decaying fire of fever, which you were suffering from under the forest of the duvet. Sleeping. Perfectly ornamented thoughts on the tiny bits of our everyday life and on the beauty of simple things. The cdr can be pre-ordered at Boltfish Recordings from this day. You’d need international credit card for that, but it is worth ordering. Unfortunately, you cannot buy it from Banyek here in Hungary, and the manufactured limited copies are on 50 pieces, so you’d better be quick." "More wonderfully coaxed shy eyed electro pop from those nice people over at Boltfish HQ this time from Soutien Gorge who to the Hungarian authorities is better known as Andras Hargitai a 22 year old jack of all trades it seems, who when he’s not crafting lunatic overtures can be found either DJ-ing under the guise of Banyek or overseeing the release roster of his two labels - Bitlab and Complimentary Distribution - the latter a free download net imprint. As per usual this tasty slice of mood musing emotive electronica comes pressed on a dinky 3 inch CD and features five starry eyed suites that when listened to in one sitting give the impression of a voyage across an unmapped continent upon some far flung idyllic intergalactic heavenly body basking beneath the warming rays of twin suns. Twinkle some, fragile, playful and minimalist scores cut with the kind of simplistic un-fussed melodic structures to be found on ISAN’s delectable ‘Digitalis’ full length from a few years ago on this occasion deftly coaxed from their sleepy headed slumber by Manual (as on the quite beautiful title track). Hargitai crafts delicately mesmerising aural figurines that flicker, pop and shimmer - part trippy part comatose as though overdosing on their own ether driven bliss amid sweetly aligned corteges of clicks, crunches, whirrs and seductive after lights down tempo tenderness. ‘madarka’ opens the set an exotic lounge like teaser that initially comes across in texture akin to the dinky little lunatic lullabies that once emanated from the late 90’s Birmingham scene and that were much a one time feature of the Warp catalogue before dissipating sublimely to be interspersed by the spectral glides of Floyd-esque riffs and fluid symphonies. ‘tierchen liebe’ gently uncoils as though a Japanese playroom coming to life by nightfall to be wonderfully pierced by moments of tranquil rustic flurries. ‘strandra’ with its fattened slices of futuro funk squiggles and house-y vibes is the perfect morning after the night before hair of the dog tonic that imagines Biosphere sharing mindsets with a particularly chilled out Future Sound of London. ‘jo ej’ wraps up the set marking the journeys end, a wonderfully envisaged montage of spectrally charged trippy interweaves, pining riffs and chiming cascades - quite perfect if you ask me. Shame we missed those nifty Amorph and ENV (litre) releases though - suppose it gives us an excuse for record shopping as if we needed one." "Usually I can start a review of something on Boltfish by stating I know nothing about the artist in question, but in the case of Soutien Gorge, I actually know that it's a duo of Andras 'Banyek' Hargitai and Robert Potys, who released 'L'Etoiles Souriantes' on Bitlab Records (see Vital Weekly 504). Back in the day I already noted that they play music along the lines of releases of "Static Caravan, Expanding Records or Highpoint Lowlife operate: melodic electronics, with (semi-) melancholic keyboards, a bit of acoustic guitars , which are processed a little and IDM rhythms", and as such nothing much changed in those almost two years. The five tracks still work along those lines and make throughout a pleasant listening of twenty some minutes. Nothing new under this sun, but soon we can use the name Boltfish to name check when writing about this kind of music. (FdW)"